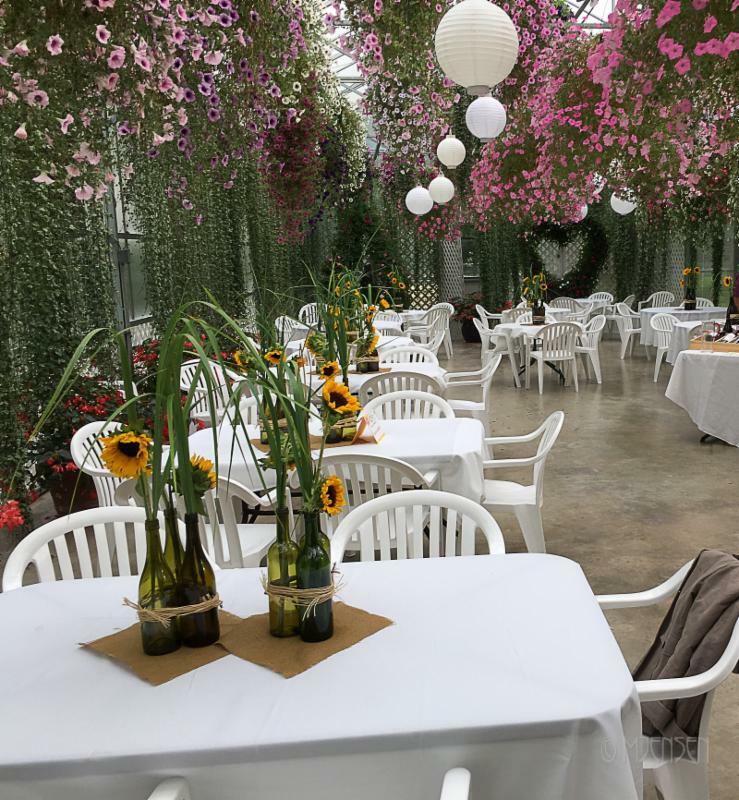 The Friends of Jensen-Olson Arboretum hosted our 5th wine tasting fundraiser August 26th at Glacier Gardens Rainforest Adventure. Suzanne Sanford once again led a team of committed volunteers to pull off this elegant and fun event. 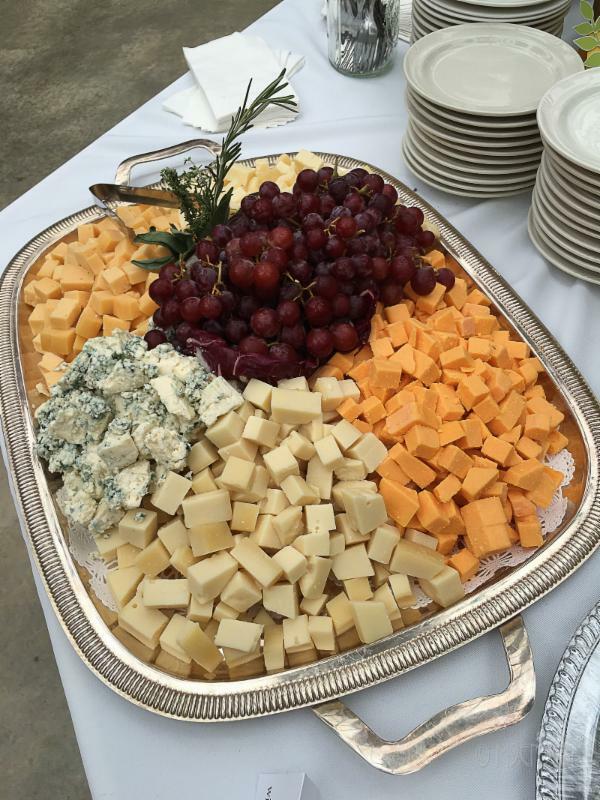 Over 150 guests enjoyed delicious food from the Hangar on the Wharf, and sampled beer from Alaska Brewing, and wines from K&L Distributors, Odom Corporation, and Specialty Imports. Linens from Alaska Laundry, flowers by Kelly Jensen, and live music performed by Jim Noel, Doug Bridges, and Clay Good rounded out a beautiful evening. Thanks again to Cindy and her staff at Glacier Gardens for helping us to host from such a lovely venue. 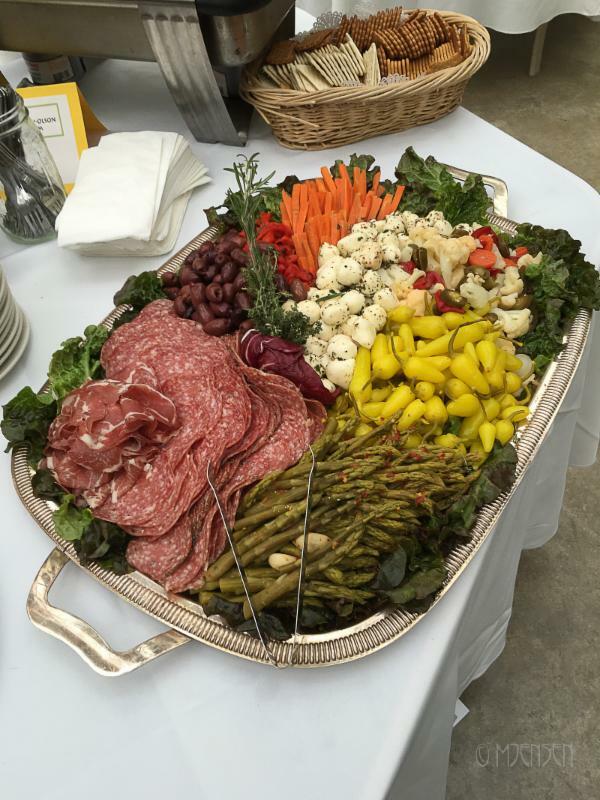 The silent auction included many garden-themed items including landscaping consultations, harvest baskets, and organic produce. Thanks to all who contributed and bid on the offerings. Bottom line, the event added over $5,700 in support of the Arboretum and everyone had a great time. Please plan on joining us in 2018 for the best wine tasting in Juneau. In late summer and early fall, I regularly engage in some of my most pleasurable moments of the year – collecting and cleaning seed from our Primula collection. 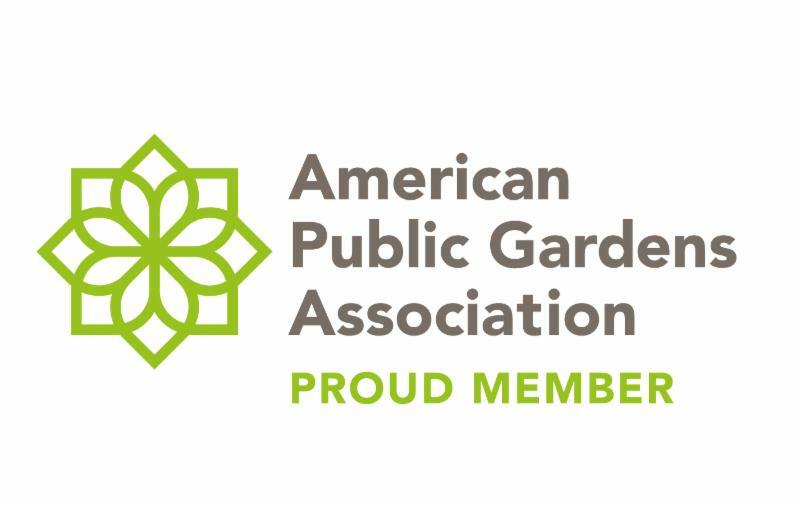 The Arboretum shares seed with two different seed exchanges - the American Primrose Society (APS) and the North American Rock Garden Society (NARGS) - every year. As seed donors, we are allowed choice seed selection (and no order fees) in exchange for the material we provide. 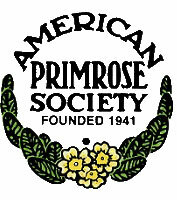 Currently, we are the largest donor of seed to the APS exchange in both variety of species and amount of seed provided. 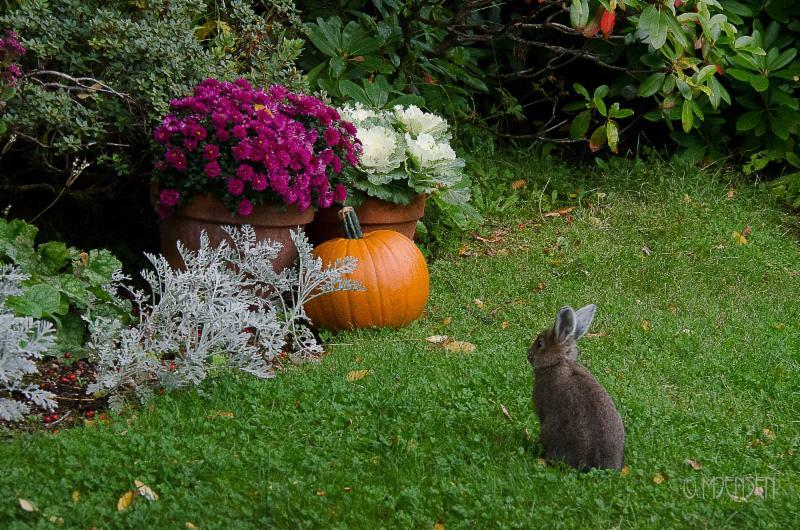 During the growing season, I select plants that have desirable flowering characteristics and/or had a robust seed set. These plants are then marked so as not to be deadheaded during routine garden maintenance. As the seed ripens, I cut off the seed heads and take them inside for complete drying. Once dry, I crush the heads and sift the resulting chaff through a series of screens to finish with fully-clean seed. Sometimes, the screens don’t completely filter all of the unwanted material; I hand-pick these remains by pouring the seed on a white plate (identifying unwanted debris is easier on a white background) and then pulling out the unwanted debris with fine-tipped, specialty tweezers. 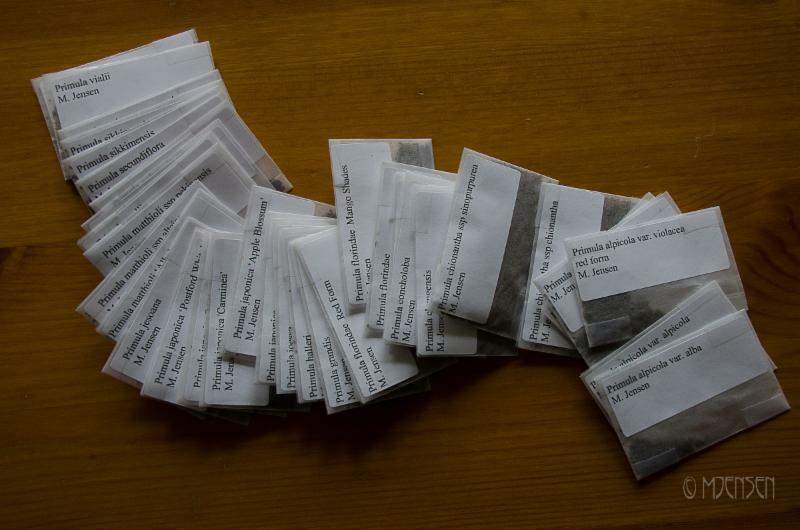 Once the final cleaning takes place, glassine envelopes are filled and then labeled with the genus, species and cultivar name (if applicable) and sealed up. I prepare a comprehensive list including the name, flower color and size of the plants for which I have sent seed. The tiny envelopes are then packed and sent to their respective exchanges. In December, the exchanges publish lists of what is available and I go shopping for new or unusual specimens and place my order. By mid-January, new seed has arrived and I start sowing. The new pots of seed are placed outside (usually in our cold frames) for their necessary cold treatment. At this time, these acquisitions are entered into the plant database with all provenance and curatorial information.
" 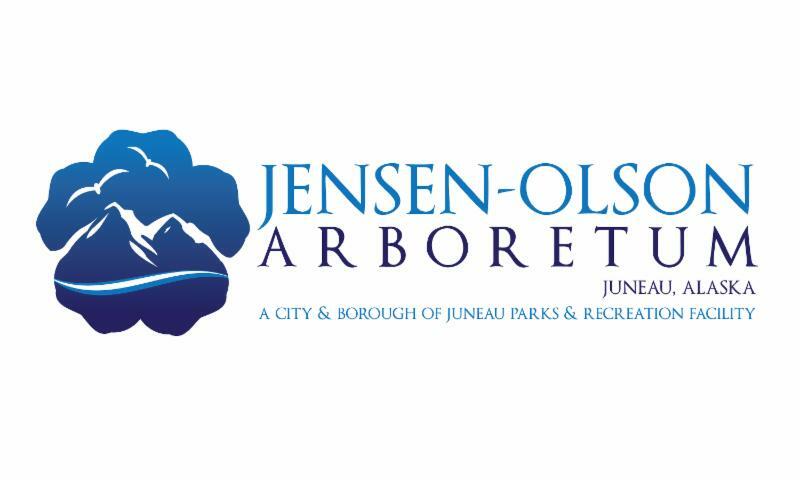 My internship experience mapping the Jensen-Olson Arboretum has been an amazing educational opportunity. Getting outside to work on real world applications with a variety of equipment allows me to gain a level of familiarity with mapping tools that I couldn't have received any better way. I am learning the best applications for different equipment, how to troubleshoot, and gaining confidence working in a new and exciting field. I work on site at an absolutely beautiful location, in phenomenal gardens right on the water. I couldn't have asked for a better educational opportunity." Look for another update in the Spring TWIGS. Snow in October? While leaves are still on the trees? 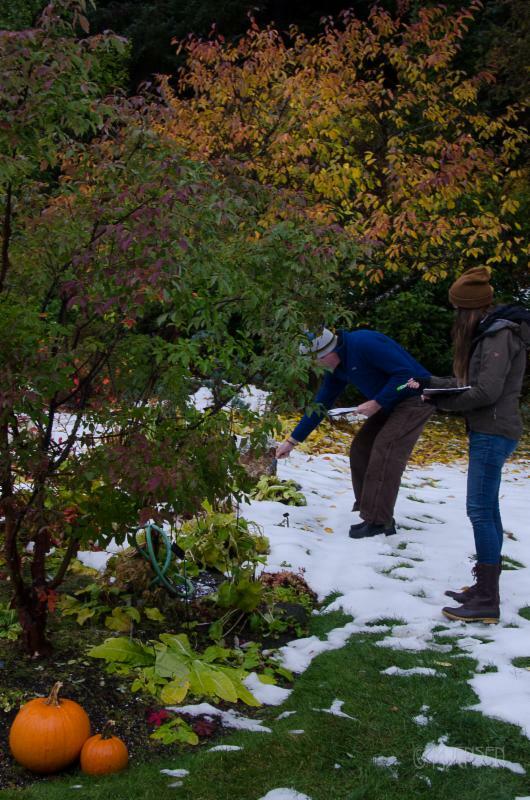 What's a public garden manager to do? Get out a headlamp and push broom, of course! 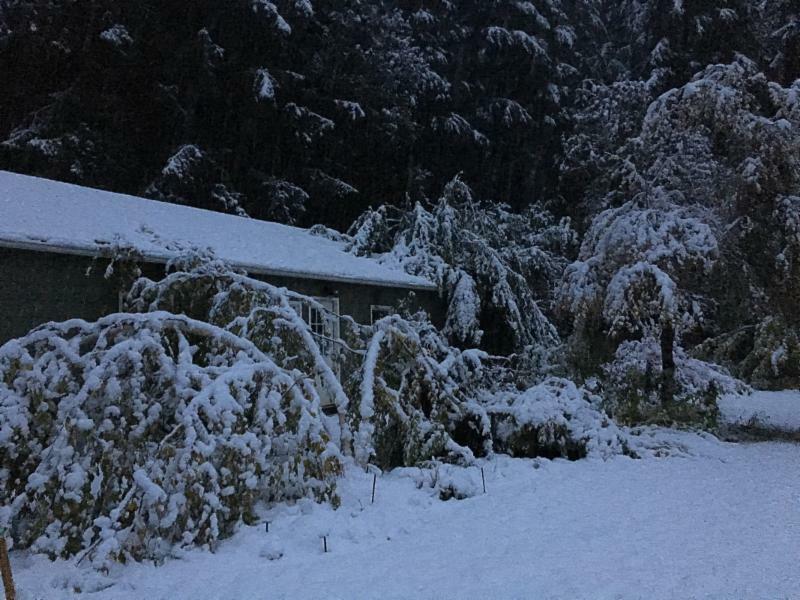 On Sunday, October 16th, we awoke to a white world with fully-leaved trees and shrubs bent to the ground under the weight of heavy snow. Gak!!! We quickly donned our winter gear, grabbed some brooms and went about pushing and shaking the snow off of the straining plants. I was most concerned about our Himalayan White Birch and several of our maples that still had their full complement of leaves. I was sure the heavy, wet snow would snap many of the branches out of these nice specimens. 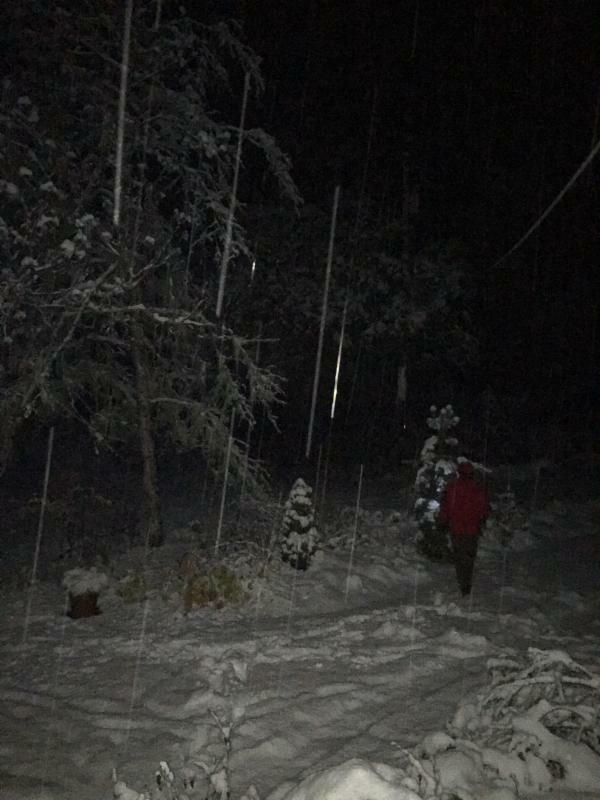 Over the course of the day and night, I was out every 2 hours clearing the plants of their snow load while listening to branches cracking and falling in the forest around me. 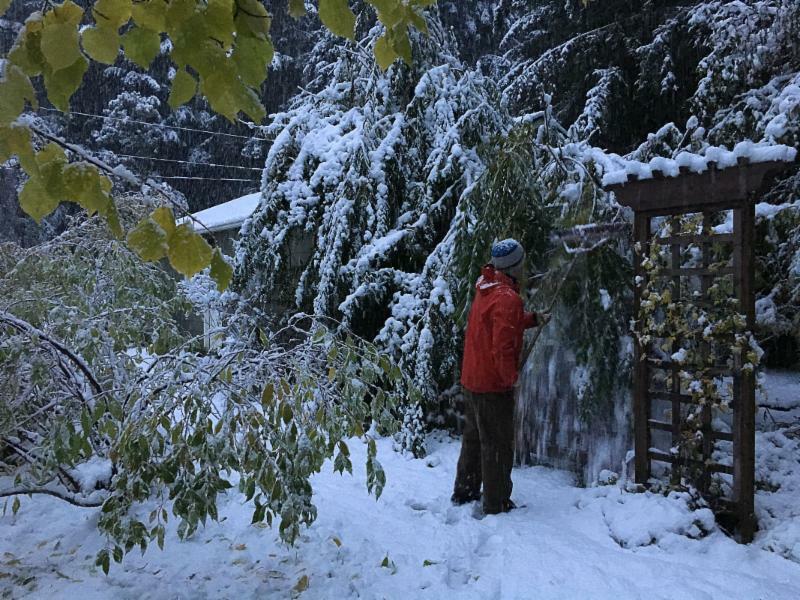 Unfortunately, the mature Norway maple that Caroline planted years ago lost 8 large branches… its large leaves can capture and hold a lot of snow and it’s too tall to clear off. Thankfully, that was the only damage. When does 80 hours = 10 years??? While mowing the Arboretum lawn in late August, I glanced down at the hours meter on the mower; the clicker had just rolled over to 80 hours. It took a moment for me to realize the significance and implications of that number. We purchased this new John Deere mower for the Arboretum in 2012 with grant funds from the Stanley Smith Horticultural Trust. With this new mower, it takes just under an hour to cut all of the turf. With 80 hours on its clicker, that’s 80 trips just in “mowing time” in which I’ve observed every square foot of the cultivated grounds. In good weather, I’m always gob smacked at what an amazing place this is and what an amazing gift Caroline bestowed upon the community of Juneau. Even on the less-than-spectacular days, when I worry about rutting the wet turf and yet still have to mow the grass, I am rewarded in my journey. As a new public garden, now celebrating our 10th Anniversary (yes, 10! 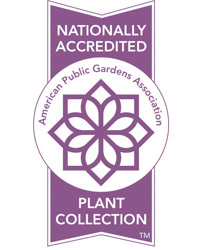 ), it is rewarding (even in the weekly mower seat) to reflect on the accomplishments: establishment of the Friends of Jensen-Olson Arboretum; refurbishing of the historic vegetable garden; national accreditation of the primrose collection; development and naming of Pt. Caroline Trail; acquisition of IrisBG plant database software according to curatorial standards; burgeoning growth of beneficial community partnerships; and identification of needs to support future growth and programs…to name a few…and along with this list of accomplishments is an even longer list of committed volunteers, staff members, friends and community members who have made it possible. Q: How long is the Pt. Caroline Trail? A: The Pt. Caroline Trail is 1/4 mile with very little elevation gain; it's a rolling trail through the forest, terminating on a cliff above the ocean where there is a lovely bench with a view. 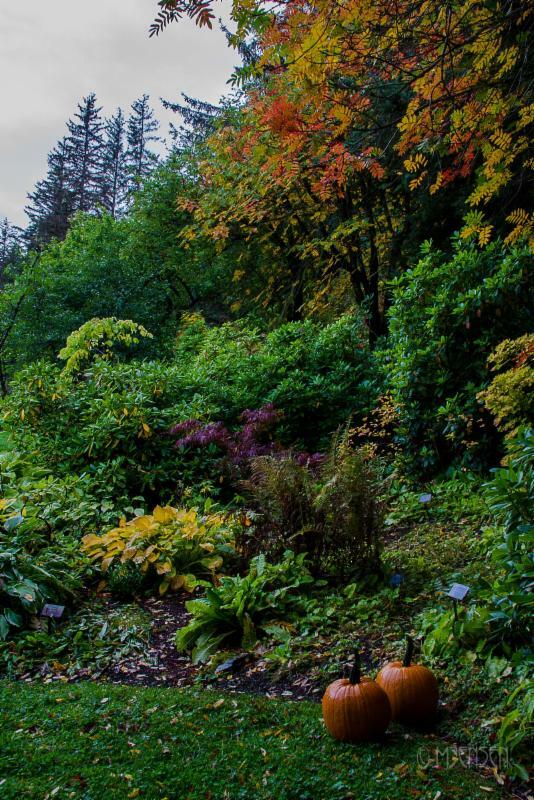 Q: Is the Arboretum open in the Winter? A: Yes; hours are the same year-round...Wednesday through Sunday, 9am - 5pm. However, the Arboretum is not open after dark, so we close the gate a bit earlier once the sunset arrives at an earlier hour. 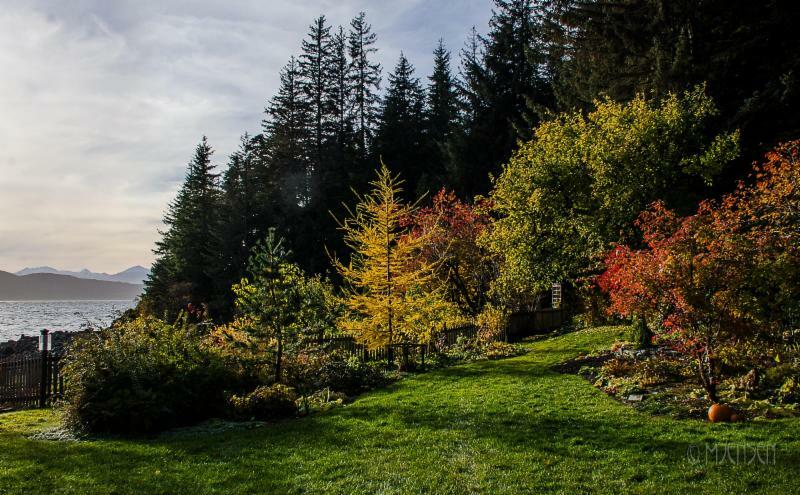 *Teaser: 2017 Arboretum Events *GLORIA - what is it & why are we involved?